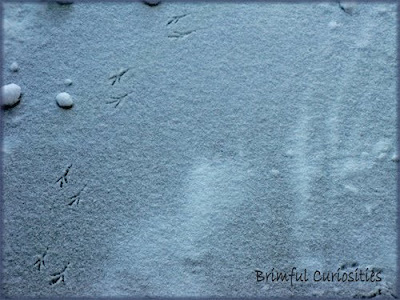 Tracks of an early bird on a snowy morning outside our home. Reminds me of one of my daughter's favorite winter books, Animals in the Snow by Margaret Wise Brown. Find more of this week's Wordless Wednesday posts at 5 Minutes for Mom. That's a neat shot! Thanks for sharing and thanks for visiting my blog. That is a great picture! The only tracks we have are of all the kids. They erased any nature tracks while playing yesterday. THat is very cool!! Happy WW! Wow, what a neat photo! What a great photo! That's worth framing. Thanks for commenting on my WW. That's a great shot...You can see the prints so well.... We have bunny tracks all over our yard the girls love it..
No snow here to enjoy. Only rain. Oh well, we'll just have to make the best of it! That is a beautiful shot! I am really loving your blog. I love all of the book suggestions! Beautiful photo! I miss the snow. We don't get any out here in California. But I used to live in Wisconsin. Wow you captured something there. Very pretty. Love the photo and thanks so much for the book suggestion! We have little bunny prints in our snow and I think my girls would love this book! Brimful Curiosities is a mom blog/book blog featuring reviews and posts on children's books, music, educational products, toys and more. It's home to the weekly "Full to the Brim" Kid's Book Giveaway List. Occasionally it includes non-children related product and book reviews and personal postings. I am an Amazon affiliate and may receive a very small commission for products purchased through my Amazon links. Every purchase helps support the Brimful Curiosities blog. Thank you. PR, Companies, Publicists, Authors, Illustrators, Publishers - Have a book or product you'd like reviewed or a giveaway you'd like to sponsor? PR welcome! Visit my contact page for more info.